Written as "Solamente Una Vez" in 1941, with both lyrics and music by Agustin Lara, known as the "Cole Porter of Mexico" for composing some of the country's most beloved classic melodies. The number was first performed by Ana María González and José Mojica in the film "Melodia de America," which was made in 1941, but this seems not to have been released as a commercial recording. (Shortly after making the film, Mojica became a Franciscan monk and was to die in utter poverty in 1974.) The first commercial recording was then made later that same year by Manuelita Arriola con la Orquesta Juan S. Garrido and released on the Mexican label Peerless (matrix 1298-41). Some reports refer to Peerless 1779, but I have been unable to confirm this, having found definite reference only to Peerless 1996. Note that Manuelita Arriola was also known as Manolita Arriola. English lyrics were written in 1943 by Ray Gilbert, and introduced by the voice of Dora Luz on the soundtrack of Walt Disney's feature-length Donald Duck cartoon "The Three Caballeros" in 1944, but this also seems not to have been released as a commercial recording. 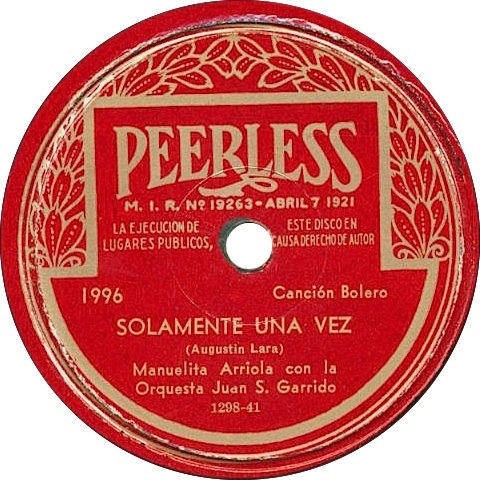 A recording of Agustín Lara himself singing "Solamente Una Vez" was made in 1953 by RCA.